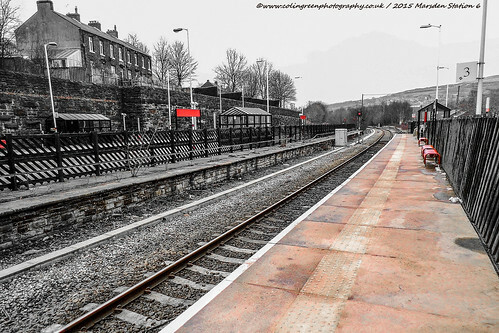 Colin Green Photography: Marsden Railway Station. 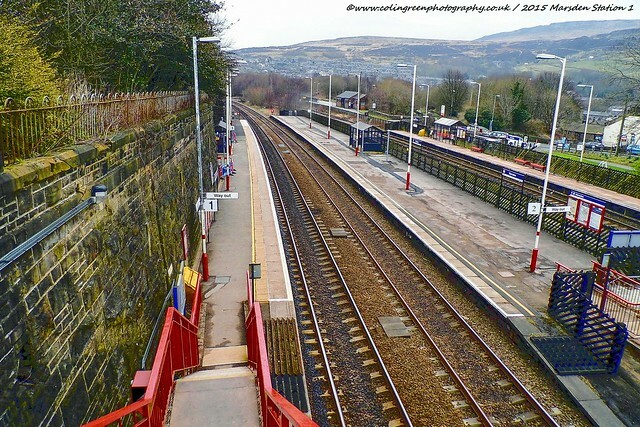 Marsden Railway Station is a train halt on the Huddersfield Line serving the village of Marsden, West Yorkshire. It is the last stop in Yorkshire on the line that connects Huddersfield with Manchester. Marsden Railway Station on Clickasnap. The station pictured from the end of platform 1 looking towards the bridge and entrances. Huddersfield Narrow Canal and Marsden Station on Clickasnap. The picture was taken from Station Road Bridge looking down on to lock 42E on the Huddersfield Narrow Canal with Platform 3 at the station visible beyond the trees. Trains at Marsden Railway Station on Clckasnap. Taken from Station Road Bridge looking down on to Platform 1 and 2 as trains were stopped in the station. These 3 can only be seen on Clickasnap and any views of over 10 seconds help support my photography. Clickasnap pay a small contributors fee to photographers. The station opened on the 1st August 1849, originally having 4 platforms, Platform 2 and 3 being an island platform and platform 4 sited near the current location of Platform 3. Platform 3 and 4 were removed in the early 1960's and the station was threatened with closure in 1968. 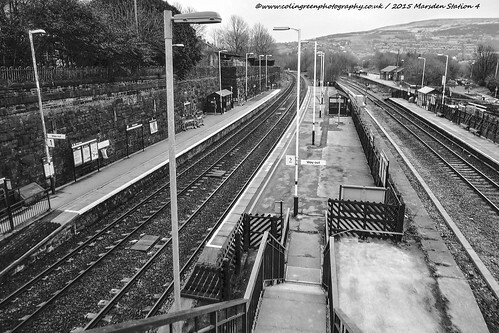 The current platform 3 was added during the 1980's in the former good sidings and this is the only step free access to the station. There are limited facilities with small shelters, no toilet facilities, electric information boards and the station is unmanned. Click here for a chance to earn free Bitcoin.